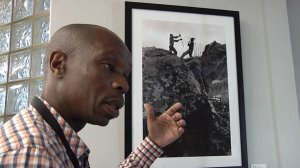 The Mandela's Roots exhibition traces Nelson Mandela's childhood journeys through rural towns in the Eastern Cape and features a series of mainly black and white photographs shot on film in Mvezo, Qunu and Mqhekezweni, and documents the landscapes and physical setting in which Mandela lives as a boy. Bonile Bam, who grew up in the Eastern Cape, explained that he wanted to tell the story of Mandela through the landscape and structures that influenced his political life. "My work represents a personal journey around spaces and times I refused to ignore. Part of my responsibility as a documentary photographer is to trace and record things I have witnessed before they forever escape the memory. The South African landscape has so much hidden in it that still needs to be brought to light. It is my intention to approach every subject or object with great respect. Dignity is the foundation of knowing what to isolate or introduce without hurting the naked eye," said Bam. The University of Johannesburg's Faculty of Humanities, UJ Library and the National Institute for the Humanities and Social Sciences are hosting the Mandela's Roots exhibition, which is open, free of charge to the general public.